If you have ever wondered where to find information about the various genealogical computer programs that are available, Kessler's Genealogy Software Links is a one stop shop. 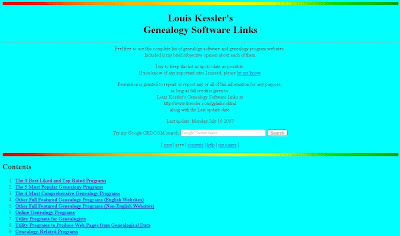 If you recall my previous post regarding the program "Behold" authored by Louis Kessler, he also maintains this Genealogy Software Links page. Louis has over 50 links to various genealogical programs consolidated in one site, providing a brief description of the program. Although not listed in the contents above, Louis also will provide you with links to the genealogical programs that will operate on the Mac and Linux operating systems. Louis is very quick to respond if you would like to provide other links that you think would benefit others. If you would like to see what is available please click here and you will be directed to the website.